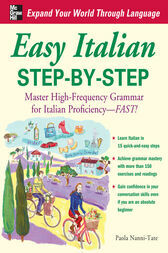 Your quickest route to learning Italian is through a solid grounding in grammar basics. Now don't be put off by the "G-word." What you won't find in this book is a lot of repetitive drills. Instead, you get an original, step-by-step approach to learning Italian based on the way people naturally acquire language. From the very beginning, you are introduced to the most essential structures--allowing you to communicate in Italian almost immediately. Gradually, through a series of interconnected "steps," you logically progress to more common concepts that govern how Italian is spoken and written. And along the way you are introduced to hundreds of carefully selected verbs and vocabulary words presented on the basis of how often they are used in everyday Italian. Paola Nanni-Tate teaches Italian at Ohio State University and is the author of Italian Verb Drills and Practice Makes Perfect: Italian Verb Tenses.